In these days of bare-knuckle fighting between upcoming start-ups and entrepreneurs, bouts take place within a large yet limited space for visibility and creativity. The contest begins the day you enrol for the registration of your venture, ending up with a fierce fight between yourself and the similar others around you. Being a fighter you might physically and mentally be ready to take on to the world and think you are up to scratch. What makes you snap out of your vulnerability? The alliance with design agencies/in-house design collaboration works best for you when you build your brand from the scratch. Why are we focusing on design first? We all are very much familiar with the phrase “First impressions are last impressions” and in this respect start-ups have to have a spectacular first impression that stays. Making impressions isn’t hard but it gets brownie points to be noticed and it doesn’t have to be taken up at the end of the business plan. Most great innovations begin with ideas that are packaged well. When most brands start out today, impressions have to match up with those few seconds of attention span and also make a worthwhile impact within that time; it becomes imperative for you to package your venture extremely well. Design plays a vital role like a co-founder. Every start-up/venture needs a co-founder and when you think of a designer (as a partner or collaboration with agency) as a co-founder more than half of your outreach job is done. This means that you can build your identity branding on a very firm footing. 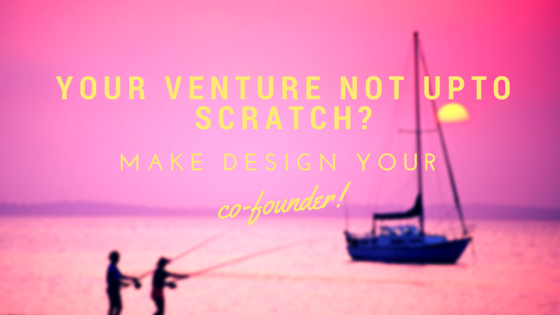 You venture might not just work for one end-user. Today the target audience is not specifically general and too often compartmentalized into groups suitable to various situations, events and even occasions. This makes it all the more necessary to keep fine tuning your brand experiences every now and then. A creative design studio will help you achieve this with different creative strategies. Your brand is your personality. And your products/services are result of your ideas. Allow a good design agency to help you build an effective connection between these two aspects. A design agency that firmly believes in communicative design can help you break off your barriers and get you to the other side without much of a problem. As a newbie start-up you want to win the world, right? Start with your brand first! Your brand will make sense only if you are yourself convinced about the essentials of design. I shall share more about the 2 essentials of design in my next blog.